As a theatre goer of over forty years and a theatre critic I have seen many professional, no expense spared productions, but I love nothing better than getting back to the roots where it all begins and watch the talent of today start on their first steps to stardom and Musical Theatre. The Performing & Production Arts Department at Pendleton Sixth Form College has an undisputed reputation for excellent teaching and for ensuring that students are given the support and encouragement they need to pursue their dreams. So good and long standing is their reputation, that they attract students from all areas of Greater Manchester and beyond, with some travelling over 30 miles to attend Pendleton. Their enrichment opportunities include fight combat classes, chamber choir, contemporary choir, Pendleton Tap Company and their Shakespeare company. They also have their performance shows which are produced with full set and costume. Pendleton’s Performing & Production Arts department presented ‘Have Yourself a Merry Little Christmas', a seasonal celebration of magical musical memories on a very cold and winter's evening in Salford. The whole atmosphere oozed community spirit from the front of house team, college staff, schoolchildren, right up to the elderly population from the area with many proud parents and family among the packed auditorium. The production team paid attention to every detail from excellent choreography and lighting to vocal instruction, making it a visual and auditory sensation. The talented cast took the audience on a magical ride of vocal excellence as they sang iconic songs of Christmas such as: ‘We need a little Christmas’, ‘it’s the most wonderful time of the year’, ‘When Christmas comes to town’, ‘The Christmas song’ and ‘I’ll be home for Christmas’. The performers are a fantastic representation of the outstanding and exceptional talent of today’s youth who captivated the audience as they sang medleys from The Sound of Music, Chitty Chitty Bang Bang, Carousel and The Wizard of Oz. 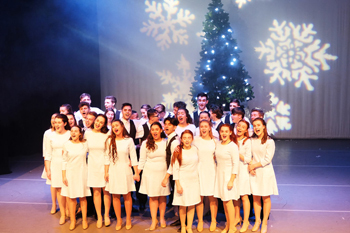 The finale consisted of ‘Have Yourself a Merry Christmas’ and ‘I’m dreaming of a white Christmas’, where we witnessed snow falling creating that magical Christmas feel of any professional musical theatre. With an energetic and talented ensemble, the show gave the audience everything they came for but for me the highlights where the beautiful costumes, excellent choreography and dedication of the performers. Huge credit to the wardrobe team and choreographer Hannah Birch. So many talented individuals all on one stage that it’s hard to believe they are young college students aged 16-18, as their professionalism and excellence is second to none. Stand out performers where those students who I have seen before in other amateur groups, and it’s clear this handful of talented individuals will no doubt make it into the theatre world and survive with their stamina and determination, not to mention their immense talent. A thoroughly enjoyable evening had by all. Well done and I’ll be watching and waiting to see some of these youngsters in the West End in a few years.